May they not turn Their backs upon me. One of the most basic aspects of paganism may be how we see the Gods. Our Gods, after all, have a concreteness to them that lends itself to imagery. We have myth, folklore, and ancient pagan artwork to pull from as we seek to imagine what our gods look like. We also have modern popular views, such as the many modern Heathens who describe Thor as red-haired. As a Reconstructionist these sources are invaluable, yet they can also be a double edged sword. For myself at least, when I envision my Gods I inevitably think of all these sources in an effort to come up with a correct image. It may produce an accurate result, but it also complicates inspiration and emotion. I am trying to take a lesson from my children now. There is a purity to the way that children approach the Gods that adults lose somewhere along the way. My oldest daughter, very unapologetically, has favorite Gods and they show up in her artwork from time to time. 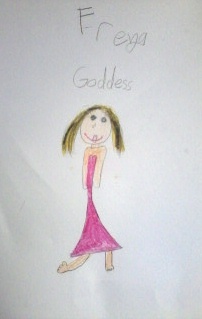 I have a drawing that she did when she was 7 of Freya; it shows the Goddess as my daughter imagines her. This is Freya from the heart, without any worry of accuracy or careful details from the lore. Its Freya as my daughter sees her without the filter we adults use for everything. There is a beautiful purity to that, even if most other people wouldn't recognize the Goddess. Its important to look to the body of myth and belief when we relate to deity, but it is just as important to listen to our hearts. 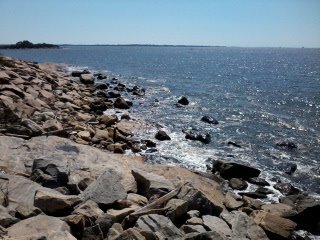 I know that I tend to let my head complicate everything which is why I am trying to find a more balanced approach. Instead of rejecting the little things that pop up in my head - Odin with a hip flask, Freya with a butterfly tattoo - I'm going to try embracing them. I'm going to let my inner voice have its say and see what it comes up with. I may even grab some crayons and have a bit of fun with this. Even if the results are images that have no meaning to anyone but me, I am going to let my inner child have its say. It is so easy to ignore our inner voice when we feel like there is a right and wrong to what we are doing, but that inner voice can add a richness that is lacking in cold hard facts. When you picture your Gods, how do you see them? Death is always difficult for the living to come to terms with, although it is said that to die to this world is to be born into the Otherworld. One thing we, as modern pagans, need more of are prayers for the dying, to help the soul move on and to comfort the living left behind. This is a blessing from the Carmina Gadelica to be said at death. I have modernized it and made it more pagan. This could work equally well as something said to a dying person as they pass or as something said to those who are grieving during a funeral or memorial service. As it returns from whence it came. The Carmina Gadelica has a variety of charms relating to specific herbs. These charms are useful to anyone who in modern practice uses herbs either medicinally or magically so I've decided to start looking at some of them here by discussing the charms and the herbs properties. I'm going to start with two charms from volume 2 about the Shamrock (Seamrog or "little clover" in Irish) which could include any species of Trefoil, although there is debate over which Trefoil exactly was originally being referenced. The most likely candidates seem to be Red or White Clover or Lesser Clover, all of which are known as Shamrocks in different areas of Ireland and Scotland. Medicinally the Shamrock has a long history of use. Historically it was used as an anti-spasmodic in the treatment of bronchitis and whooping cough (Grieve, 1971). It may also have been used in poultices to treat cancerous tumors (Grieve, 1971). Red Clover is still used medicinally today as an anti-spasmodic and anti-tumor, as well as a diuretic, expectorant, and stimulant (DeVries, 2010). White Clover in America has a long medicinal use as well, externally treating skin disorders, gout symptoms, and eye problems, and used in a tea for fevers and coughs (Plant Life, 2012). Because there are multiple types of Trefoils that are called Shamrocks anyone seeking to use them medicinally needs to clearly identify which exact type of clover they are dealing with and research its unique medicinal properties before using it. Magically Shamrocks are best known for bringing good luck. Additionally modern magical practitioners use them for success, money, protection, love, and fidelity (Cunningham, 1985). When utilizing the traditional charms from the Carmina Gadelica for Shamrocks one might also add peace, fertility, and health to its magical uses. For that purpose you would want to chant the charm over the plant while harvesting it and save it for later use or carry it with you to gain its effect. Below are my updated pagan versions of the traditional Shamrock charms. Charm #170 is meant to be used with lucky clovers which may have four or five leaves, depending on which school of thought the person follows, as some say that four leaves are lucky and others favor five. From page 106 of Volume 2 of the Carmina Gadelica “some people say that the lucky shamrock has four leaves, other say five, but all agree it must be found by chance not sought out intentionally. Once found it is preserved as a peerless talisman.” (Carmichael, 1900). The charm references seven joys, including health, friends, cattle, sheep, children, peace and piety, all of which are magnified by possessing a lucky four (or five) leaf shamrock. This next short charm is rather ambiguous in its meaning and could apply to any type of clover. It seems to me to imply both a protective quality to the shamrock and an association with the dead. It may also mean that shamrocks are good to plant on graves. One thing about the internet, there is never a shortage of memes going around. 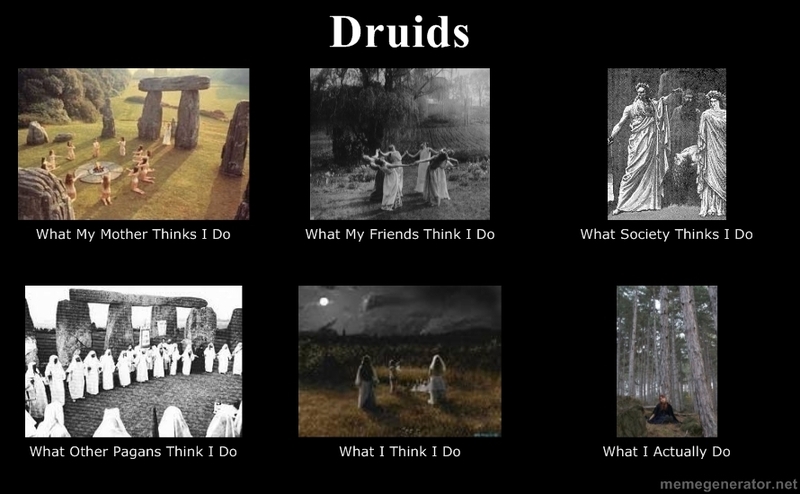 One that's been making the rounds for a while is a Druid version of the popular "What I Do" meme. I decided it was time to make my own version, one that I could relate more to. My version has images that include or focus on female Druids and portrays each category as I feel it. I am pretty sure, for example, that my mother thinks I spend my free time doing strange rituals naked in the woods, and I know that while I think I spend my time in solemn rites honoring the Gods, the reality is that most of what I do is contemplate my faith, my world, and the Spirits. Having completed the first aett we move on to the second, which begins with Hagalaz. Hagalaz looks like an English upper case "H" with the crossbar slanted downwards, and indeed it represents an "h" sound as well. This makes Hagalaz one of the easier runes to remember on sight and to write with. This rune appears in this form in the Elder Futhark, but may have a different form in other Futharks. Christ created the world of old." From this we can easily grasp the basic meaning of this rune: hail. Each rune poem references it, although the Anglo-saxon gives it the least harsh feel. Both the Icelandic and Norwegian call it the coldest of grain, while the Anglo-saxon says it is the whitest. The Icelandic also relates it to sleet while the Anglo-saxon says that it turns into water. Anyone who has experienced hail knows that it stings when it hits you and can cause great damage to the environment. Hail can destroy an entire harvest and may also be associated with, or even the harbinger of, a worse storm. Sleet makes the ground slippery and treacherous and is truly miserable to travel in; it may also create flooding or freeze into ice depending on the temperature. Looking at all of this we can understand this rune as representing unexpected destruction or loss, particularly of what we have worked for. It may also symbolize a disruptive event or the sudden end to a situation. Some people see Hagalaz as a loss that opens the way for new beginnings or in some sense wipes the slate clean. Others view this rune as a sign of disaster, destruction, and disruption in general, although it may also be seen as transformation (as ice melts to water) and the potential for new growth from the old. In divination Hagalaz can appear as a warning of potential disaster to offer the opportunity to change course, or a sign that what is being worked for will soon be lost. In some cases it represents losing what exists now in favor of what is potentially better, while in others it may be a sign of the futility of fighting to keep what is doomed. It represents an ending or loss however the runes around it may amplify or mitigate it's message. Magically Hagalaz should be used with great caution. It may be used to unbind something but with the understanding that it will tear down to provide an opportunity to build back up rather than simply loosen. Its the difference between untying a cord (gently unbinding) and setting the cord on fire (using Hagalaz). This rune can also be used to hex or curse if the goal is to utterly tear down or destroy. I would not recommend using it on yourself to release the old and get a fresh start, as it's energy is likely to have extreme effects, unless you believe there is no other option to free yourself from a situation.